You have probably heard the old proverb, “One bad apple can spoil the whole bunch.” Although the meaning of the proverb is directed at things besides apples, it is based on a true fact for many fruits and vegetables. The storage location and temperature, quality of the product and what they are store with makes a big difference in their storage life. This is due primarily to a plant hormone ethylene, sometimes referred to as the “ripening hormone.” It is a colorless, ordorless gas that is naturally produced by plants. It functions as a plant growth regulator and triggers specific events, such as ripening. As the fruit ripens, ethylene causes cells to degrade, fruit to turn softer and sweeter, leaves to drop on plants, and seeds or buds to sprout. Some fruits and vegetables are high ethylene producers, others produce very little ethylene and may be sensitive to it. Fruits and vegetables are classified as “climacteric” or “non-climacteric” depending on their response to ethylene. Climacteric species emit a greater amount of ethylene as they ripen, and after ripening peaks, the production of ethylene gas drops off significantly. Thus, climacteric fruits have a fast period of ripening during which they soften and develop flavor and aroma. Climacteric fruits will continuing to ripen after they are harvested, as you may have noted with green bananas and mature green tomatoes, pears, mangos, peaches, apples, and avocados. Non-climacteric plants, such as leafy and root vegetables, citrus, cherries, and berries, produce very little ethylene and do not continue to ripen after harvest; however, they will soften and rot as they age (See table below). Ethylene isn’t all bad, however. It’s ripening effect on crops is used commercially for the artificial ripening of the fruits. This has made it possible for tropical fruits such as mangoes and bananas to be harvested green and shipped to distant markets, where they are ripened under controlled conditions. So what does this have to do with the bad apple affecting the whole bunch? It has to do with the fact that high ethylene producers should not be stored with ethylene-sensitive crops. For example, if spinach, kale, or broccoli is stored in the same refrigerator bin as apples, those crops will turn yellow and limp in just a couple of days. You also don’t store potatoes and onions together because the potatoes emit ethylene which will cause premature sprouting of the onions. Fruit that is damaged, such as bruised or punctured, will produce more ethylene, causing the others to ripen, soften and spoil faster; so always use the damaged fruit first and don’t store them with unblemished product. 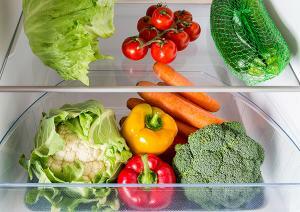 Temperature is another factor to consider when storing fresh fruits and vegetables. Cold-sensitive fruits and veggies lose flavor and moisture at low temperatures. Store them on the counter, not in the fridge. DON’T REFRIGERATE these ethylene producers: avocados, unripe bananas, nectarines, peaches, pears, plums, and tomatoes. Also, never refrigerate potatoes, onions, winter squash or garlic. Hopefully, you can use this information to extend the life of your produce by keeping certain items separate in the fruit bowl or refrigerator drawer. For more information on harvesting and storing vegetables, refer to Iowa State University and Outreach publication, PM-731, Harvesting and Storing Vegetables.